First Friday Art Walk. Wine is LIQUID ART. Indulge in a bounty of artists in diverse mediums during the First Friday Art Walk. Oh and take in some WINE as well. Sip's FIRST FRIDAY includes only places that also pour wine. After all. 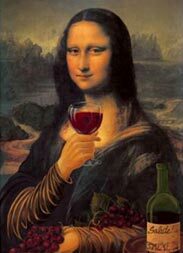 wine is liquid Art and this is a WINE blog :) All venues will be open Friday, March 3, 2012 from 5:30-8:00PM unless noted otherwise. Sip's list is only art stops that include WINE, which is liquid art. Join Barili Cellars on Friday, March 2, from 4 to 9 p.m. and enjoy four current wine releases, paintings by artist Jim Dhillon, and live music by Celtic Rock band, Free Whiskey. Call 995-4077 SIP TIP: Don't miss sipping the Cabernet Sauvignon. Featuring metal mobile, wall and floor art by Joe Wrazido. Music by Kari Marguerite and the Seventy-Six. Two wineries together in one location. SCORE! Exhibiting lithographs and photos by local artist Ken Parks. His work features "IKEBANA" a Japanese form of flower arrangement and local architectural design. Artist reception. ART + lots 'o WINE. Over 60 wines by the glass. Come enjoy some good wine, good food, amazing art. Happy Hour 3-6pm Live. Music 8-11pm. SIP TIP: trust your flight attendant. Come enjoy Contemporary, Jazz, and Pop hits in the Peacock Lounge. SIP TIP: Try a Mountain Dome sparkling cocktail. 8 N. Post NEW LOCATION! Check out the new location and enjoy live music by Janet Johnson and paintings by local artist Debbie McCully, 6-9pm. SIP TIP: St Vincent is SIP's fave. Join RK and SIP the newly released 2009 Malbec and paintings by artist Marilyn Meyer. Whether using pastels, oils or watercolor, Marilyn captures the heart and soul of the wildlife of the Pacific Northwest in her work. SIP TIP: try the marvelous Malbec. Presenting paintings by Melissa Cole and Kim Long, "Rock, Paper, Glass." Artists' reception 5pm. Beacon Hill's Bistro Buffet from 6-8pm. Music by "Lonesome" Lyle Morse from 6:30-10pm. SIP TIP: Cab Franc or Rough Justice baby. Recent fine arts graduate of WSU, Eric-Alain Parker, will be displaying oil paintings form his "Come out of the Kuo" collection. Artist reception.SIP TIP: Try the new award winning GRC 7 Hills Merlot. Featuring artist Kathy Gale, her work leans heavily towards impression is with a strong abstract quality. Also featuring jewelry artist Joy Miller who specializes in one-of-a-kind pieces made from coins of the world. Sample Steam Plant’s handcrafted beers and regional wines. Dine before or after in Stacks restaurant or the Pub . Featuring Spokane photographer Ned Fox. Try our delicious menu of appetizers by Cruisers! Join us for great music by Ray Vasques. Sample our eats menu with half price all food, paired with Happy Hour cocktail pricing (3-6pm) and amazing martinis. Nectar Tasting Room welcomes the fine art of Christina Deubel and swinging jazz by Rachael Bade-McMurphy Jazz Trio. Enjoy fine wine from 5 Washington Wineries and an expanded small plate and appetizer menu. Artist reception. Music 6:30-9:30. SIP TIP: Over 40 wines on the menu from 5 Washington wineries. Go for Hard Row to Hoe. Robert Sevilla Naudon, formerly a Dreamworks animator and Rose Parade float builder, displays his personal studies, experiments, and mix media ideas. Robert currently makes his home in Spokane and is a full time designer and fabricator of architectural metals. Sure their reds are remarkable but I love BEBOP! Such a great food pairing wine. Be a part of ART (and WINE). Concept Home 401 W. First will also feature a wine bar at our First Friday event. Paintings by Darcy Dury. $5 donation at the door to the Spokane Humane Society. Thanks! Thank you! Concept Home has been added. Gallery of THUM Merry Christmas! First Friday December 3! 5 to 9pm at Gallery of THUM! watch it come to life. In his sculpture, you will see how his methods of shaping and coloring metal result in Icons of Nature and Spirit. He takes his inspiration from nature, of course, but also his Celtic roots, yoga, and his appreciation for Native American Culture. material mounted on black canvas. A must see will also be the emerging characters of Kate Robbins; her lively creations are needle felted and born into darling marionettes. Last but certainly not least: Ralph Carson, will also be with us. He paints ‘Old home town Spokane’, and the surrounding flora and fauna of yore. So be sure to make it to the Gallery of THUM, 2910 N Monroe, the perfect place to buy local art from local artists. As always, parking is free and the reception features hot coffee, chocolate, cider and other libations. Installed until Dec 31. First Friday Fun @ The Fox has live music, the MAC's Art @ Work, tours of the theater, and of course the 1st Ave. Bistro has wine, beer and mixed drinks. The Fox is right on the way to tasting rooms down the street. Thank you to the Valley businesses like Bottles and the Millwood Gallery for participating and hosting in the Spokane Valley Sip of Art and Wine. We had a very nice and relaxing time socializing with friends of the community and browsing through your creative tastes and talents! We appreciate what you do for us.